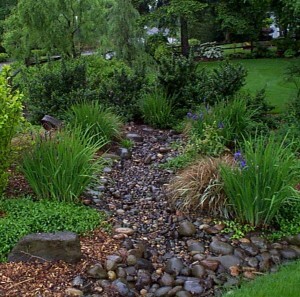 Five Design Secrets For a Fantastic Four Season Garden - Ann Nickerson Landscape Design, Inc.
Having a great looking yard is not impossible. It just takes planning, a little bit ‘o luck and a modicum of knowledge about what takes a garden from humdrum to ‘way-cool’. Here are my personal rules for a great design. 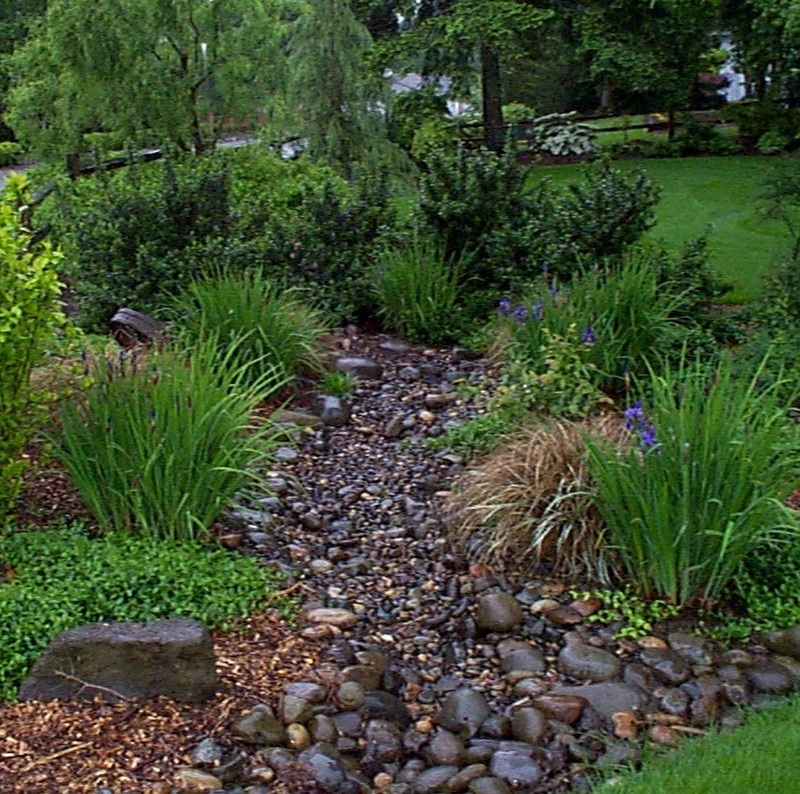 The first mistake gardeners usually make is too much uniformity. If one or three of something is nice, then a whole line must be better. To increase visual interest, vary the outline of the border with different height plants as the backdrop. Think of what a cityscape looks like. The buildings are tall and short, fat and skinny. Sometimes they even come in pairs. It is the variety of shapes and sizes that makes a cityscape more interesting than an apartment complex. Find your star and feature it! When combining plants, think of placing them in groups with a main star (focus point) and a lot of supporting actors. Include tall, medium and low plants in each planting group. Usually the tall items would be towards the back with medium and low plants filling in the center and front area. 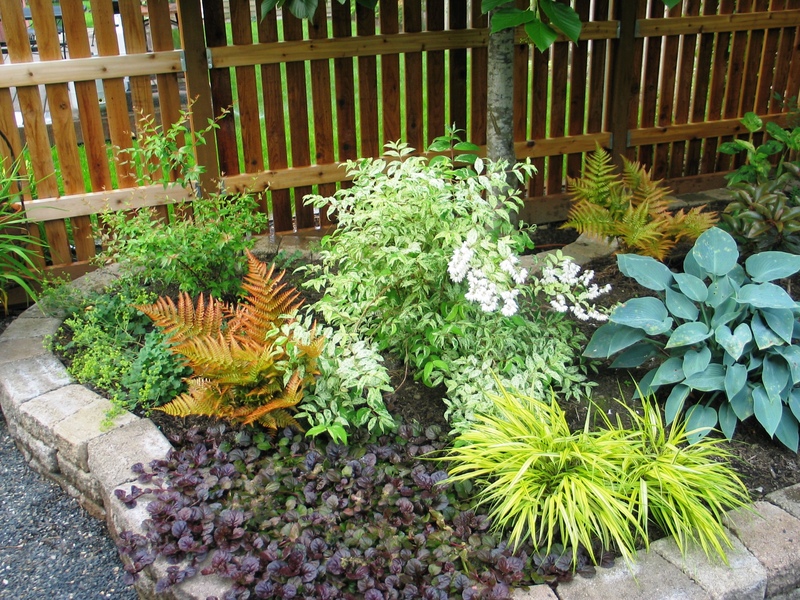 Occasionally it’s fun to mix it up a bit by placing a taller item forward and inter-planting lower shrubs and perennials around them. 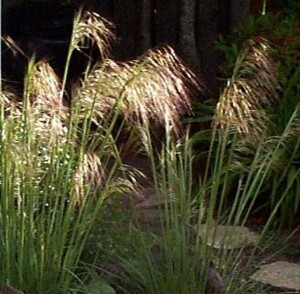 Novices make two mistakes when choosing how many plants of one kind to buy. They either assume that since their body has two of most things that their yard should also. Or they have plant lust and must have one of everything they see in the nursery! The only items that should be planted in groups of one are focal plants. Most other plants are supporting characters and need mass to balance the visual weight of the focal item. Use these plants to frame the focal plant with a 2 & 3 grouping or a 1 & 2 grouping. Our novice friends want to place their pair of plants on either side of the focal point, but that looks constrained and out of place in our more natural styles. Once you’ve got the rules figured out, toss in two of something occasionally just to break the rules – but offset them! Select plants for four season interest. – Think bark, shape & leaf color. Too often beginners only focus on the flower and forget the other attributes of the plant. Each plant has mass, color, texture and shape. Theses qualities can change from season to season. Some plants scream ‘look at me’ for a season, others have something interesting to look at two or three seasons of the year. 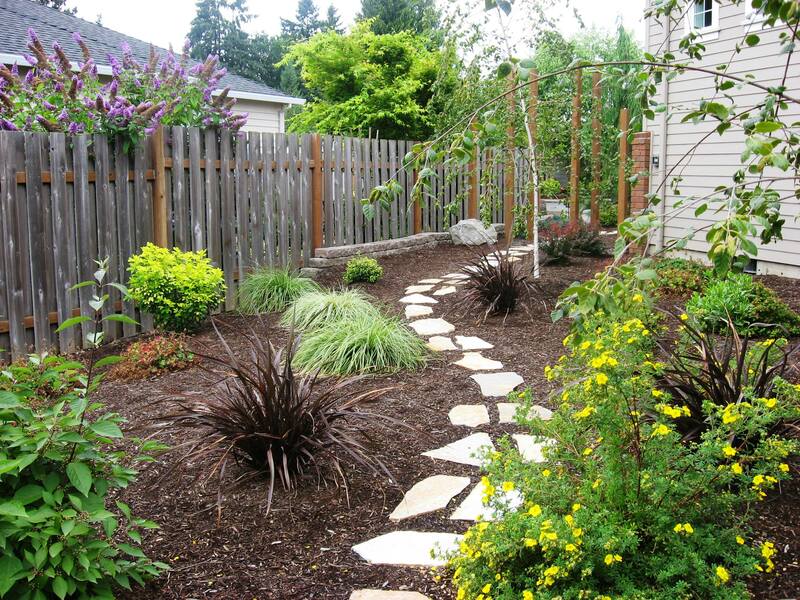 Before choosing a plant, think about what you want it to do for you. For example, do you need a focal point, some filler, some winter interest, a plant to block a nasty view or to frame a good view. Remember, flower is the least important characteristic to base a choice on – purpose, form, texture and leaf color come first. 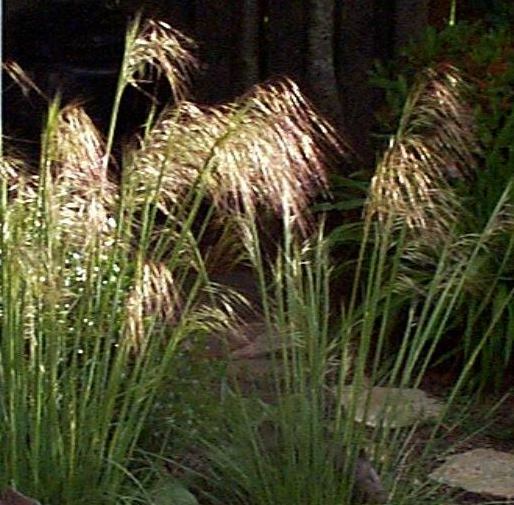 The easiest way to integrate winter interest is to have 50% of the plant material in the border be evergreen, broad leaf evergreen, an ornamental grass or have some characteristic that shines in the winter. Plant with room to grow! When placing plants, give them plenty of room to attain their full size. 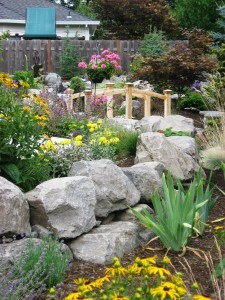 I use annuals or easy to divide and move perennials to fill in empty spaces the first few years. Expect the garden to change over time and change with it. Don’t fight it! If your tree gets big and the grass under it stops growing, it’s time to rip out the grass and plant hostas or something else that loves shade. The fact that our gardens are living art that changes over time is part of the fun.